Home > Catalog > Where Have All the Liberals Gone? Ever since the publication of Race, IQ, and Jensen (1980), Professor James R. Flynn has been the most respected critic of the notion that the IQ gap between black and white Americans is genetic in origin. This new book is a must for those who want to be up to date with that debate. He also offers an alternative to the vision of American society popularized by The Bell Curve. His overriding purpose is to rearm American idealism with new ideas. Where have all the Liberals Gone? addresses all those who want "something better than a foreign policy that provokes disgust, a domestic politics with neither the vision nor the resources to promote the common good, and a foolish relativism that reduces all ideals to the lowest common denominator." Professor Flynn analyzes the black marriage market, the case for affirmative action, the folly of Iraq, and the liberal failure of will. He traces the history of American idealism from Jefferson to the followers of Leo Strauss. The book ends with a powerful defense of humane ideals and human autonomy. Social scientists, philosophers, and the general public will find this book exciting, unique and the style clear and attractive. Prologue; Part I. St. Thomas Jefferson: 1. Something beautiful is vanished; Part II. Blacks and the Pursuit of Happiness: 2. The lost boys; 3. What Germany did that America has not; 4. Do we want affirmative action for whites only? ; Part III. Yours for a Better World: 5. Saving equality from the dustbin of history; 6. Jefferson and Social Democracy; 7. The America who would be king; Part IV. A History of Moral Confusion: 8. William James and Leo Strauss; 9. The status of the good life; 10. Choosing to be free; Epilogue; Appendix: Tables. “Flynn brings moral philosophy to bear on America's political and social malaise. The result is a unique and challenging vision of an American future in which ‘justice for all’ has a significantly broader and more substantial meaning than it does in practice now." "This book is a kind of autobiography in which Flynn, one of the most interesting and independent thinkers of his generation, offers his overall view of the United States: its past, its values, its problems, and its best possible future. It contains the latest on the race and IQ debate and a fascinating chapter on Leo Strauss and his followers." "For decades, Professor Flynn has been among the most honorable and distinguished commentators in the world on issues of race, class, and psychology. His tenacious study of the science of intelligence and the powerful and scrupulous arguments he has produced have undermined many a fallacious theory connecting race and IQ. 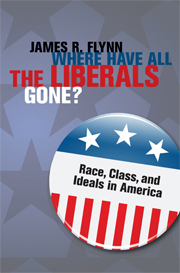 In Where Have All the Liberals Gone?, Flynn brings his own formidable intelligence to bear on the central problem afflicting American politics and society - the enormous disparity between the conditions under which members of different social groups participate in the pursuit of happiness. Flynn’s understanding of social and psychological trends and the power and care with which he articulates our ideals of equality and freedom give him unique authority to address these issues about inequality." "In this timely critique drenched in classical philosophy, Flynn, renowned intelligence researcher and discoverer of the ‘Flynn Effect’ (which shows that IQ scores rise over generations), inveighs that America has gone astray—in discourse and praxis—from its Jeffersonian, egalitarian roots. Flynn launches a respectful rebuttal of Herrnstein and Murray’s The Bell Curve, providing a wealth of statistics suggesting that environmental factors not genetic differences—account for the IQ gap between blacks and whites."